Southeast New Jersey Christmas Tree Farms: choose-and-cut Christmas trees, Tree lots with pre-cut trees, stands, sleigh rides, hay rides and related winter events and fun! 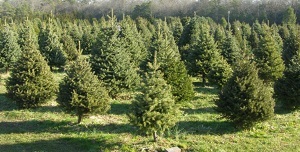 Whether you want to cut your own tree, pick a live tree and have it cut for you, buy a tree already cut or buy a living tree you can plant, this page provides detailed listings of Southeast New Jersey's choose-and-cut Christmas tree farms, places to buy pre-cut (also called pre-harvested and fresh-cut) trees, stands, sleigh rides, hay rides and related winter events and fun. Some listings are for tree farms, others are tree lots, and some only offer hay rides, sleigh rides or other winter events. READ EACH LISTING to know what each facility offers. The farms are listed further down this page, so scroll down the page! Since this service is free and open to ALL Christmas tree farms, not just those who belong to an association or pay for an ad, like almost all other websites do, this is the most complete and current listing available! I'm always looking for more to add, and to correct any inaccuracies or errors, so if you encounter any, please email me ! And please tell the farmer you visit in Southeast New Jersey that you found their farm here! I need the farmers to realize that you found them here so that they will keep their information up to date! Corner of West Jersey & Walnut Avenues, Egg Harbor Twp, NJ. Phone: 609-641-5459. Directions: One mile West of Shore Mall. Open: 9 am to 5 pm, daily, from the day after Thanksgiving to December 24th. 403 Old River Road, Mays Landing, NJ 08330. Phone: 609-625-2307. Email: duprasevergreenacres@gmail.com. Open: from the Friday after Thanksgiving on Friday and Saturday from 9 am to 4:30 pm; Sunday from 10 am to 4:30 pm; Closed on Monday, Tuesday, Wednesday, & Thursday (all day); (including Thanksgiving Day. Click here for current open hours, days and dates. Directions: From the traffic light at the Sugar Hill Inn and Testas Good Guys Pub, drive one mile south on Mays Landing Somers Point Road (County Route 559). Look for the green Christmas Tree sign at the end of River Road. Turn right onto River Road and look for the farm sign on the left (about 100 yards). Click here for a map and directions. Payment: Cash, only. You Choose and We cut varieties: Douglas Fir, Norway Spruce, White Pine. 116 South Chew Road, Hammonton, NJ 08037. Phone: 609-561-8575. Email: info@HollyRidgeTreeFarm.com. Open: from the Friday after Thanksgiving on Friday, Saturday and Sunday from 9 am to 4:30 pm; Tuesday thru Thursday from 10 am to 4:30 pm, Closed Monday. Directions: From Philadelphia or Atlantic City areas via Atlantic City Expressway, take Exit 28 to Route 54 North. Approximately one mile, turn right on Route 559, go .3 mile to farm on right. Click here for a map and directions. We use integrated pest management practices. Payment: Cash, Check. Grave Blankets made on premises; tastefully decorated fresh Wreaths; sturdy tree stands. Tagging is permitted. Select a tree from our 8+ acres - tabletop to 12+ feet. We have. Wreaths & Grave Blankets - handmade on premises, tastefully decorated White Pine Roping - handmade, thick and heavy. We use freshly harvested greens from our farm. WE DO NOT ALLOW CUSTOMERS TO CUT TREES; you choose it, and we'll cut it for you!. 219 South Cologne Avenue, Egg Harbor City, NJ 08215. Phone: 609-965-4772. Fax: 609-965-1629. Email: info@homesteadnurseryatgalloway.com. Open: November 23rd thru December 23rd on Fridays, Saturdays and Sundays from 9:30 - 4:30 for Tree Tagging and Choose & Cut trees, Wreaths & Grave Blankets. Directions: From the White Horse Pike (Route 30) go North on Cologne Avenue thru Duerer Street intersection and the Nursery will be on your left. Click here for a map and directions. Payment: Cash, Check, Debit cards, Visa/MasterCard, Discover, AmEx. grave blankets and poinsettias.Click here for a link to our Facebook page. Note: their website is not working in 2018 - check their Facebook page instead. You Choose and We cut varieties: Blue Spruce, White Fir (Concolor Fir), Douglas Fir, Norway Spruce, White Fir (Concolor Fir), White Pine. PreCut varieties: Blue Spruce, White Fir (Concolor Fir), Douglas Fir, Norway Spruce, White Fir (Concolor Fir), White Pine. 1100 Elwood Rd Elwood, NJ. Phone: 609-567-3028. Open: UPDATE for 2018, Their website is gone; Does anyone have current information, are they still in business and open? If so, please write me, their last reported hours were Call before you go; there are no recent updates on their Facebook page; 9 to 4:30 pm, daily, from December 1 to December 24. Directions: Take White Horse Pike (Rte. 30) to light in Elwood. Elwood Road North 1 mile. farm on left. Click here for a link to our Facebook page. Note: Lanza's website was identified in 2018 by Norton-Symantec as hosting a malicious virus, so we have removed links to their website. Their Facebook page is safe. 7541 Weymouth Road, Hammonton, NJ. Phone: 609-567-0336. Directions: A.C. Expwy Exit 28 to Rte. 54 N �1/4 mile to 2nd Road - right 3 and 1/2 miles to Weymouth Road - right �1/4 mile to farm; Rte. 322 to Rte. 559 N. - 5 miles to farm; Rte. 30 to Weymouth Road S. - farm 2 mile. Open: 9 am to 5 pm, Friday, Saturday and Sunday, from the day after Thanksgiving to December 23. Mannheim Avenue And Liebig Street, Galloway Twp., NJ 08215. Phone: 609-965-4646. Open: See our website for current hours. ; from mid-November until November 30th on 7 days a week from 11 am to 4 pm and December 1st to 24th on 7 days a week from 10 am to 5 pm. Directions: Click here for a map and directions./a> Payment: Cash, Check. Click here for a link to our Facebook page. You Choose and We cut varieties: Canaan Fir, Colorado Blue Spruce, White Fir (Concolor Fir), Douglas Fir, Eastern White Pine. PreCut varieties: Blue Spruce, Douglas Fir, Fraser Fir, Noble Fir. Living, rooted tree varieties: Colorado Blue Spruce, White Fir (Concolor Fir), Douglas Fir, Eastern White Pine, Norway Spruce. 723 W. Herschel Street, Galloway Twp., NJ 08215. Phone: 609-593-6180. Fax: 609-593-6180. Email: randjcornmaze@comcast.net. Open: Tree Cutting Hours 9 am to 4:30pm on Friday, Saturday and Sunday; and Santa will be here Saturday and Sunday from 11 am to 4 pm.. Click here for current open hours, days and dates. Directions: Click here for a map and directions. Payment: Cash, Check. Take your pick between thousands of Douglas Firs, Norways, White Pine and Frasier Firs. If you thought deciding on that perfect pumpkin in October was a challenge, just try to make a selection with these perfectly trimmed Christmas trees. We have 2 locations to search for your tree. The brand new section that opened for the first time this year is located where our maze and hayride operate at 723 W. Herschel St. The other location is at 236 S. Cologne Avenue. There are grave blankets, evergreen wreaths and some crafty deco mesh wreaths available to purchase. We also have some balled trees for those that want to replant their tree outside after the holidays. We pride ourselves in growing the best trees at an affordable price. We are a "Choose and Cut" tree farm. You just pick the tree out and we will cut it, bag it, and secure it to your vehicle. We grow Douglas Fir, Norway Spruce, and Blue Spruce. In the near future we will have Concolor Fir available. The Concolor have a citrus scent to them instead of the usual pine. They have a few more years left to grow but you are welcome to ask where they are a take a sniff! We are also bringing in Frasier Fir and Canaan Fir.Click here for a link to our Facebook page. You Choose and We cut varieties: Balsam Fir, Colorado Blue Spruce, Douglas Fir, White Fir (Concolor Fir), White Pine. 1410 Heidelberg Avenue, Egg Harbor, NJ 08234. Phone: 609-965 7646. 268 Pomona Avenue, Port Republic, NJ, 08241. Phone: 609-748 6368. 310 Old Tuckahoe Road, Petersburg, NJ. Phone: 609-628-2758. Directions: Rte. 50 stop light in Petersburg-Rte. 610 E - left on Old Tuckahoe Road - 7th house on left; From Marmora - Rte. 631 to Rte. 610, left 1/10 mile - right on Old Tuckahoe Road. Open: 1 pm to 4 (Fridays in Dec), 9-4 (Saturday and Sunday), from the day after Thanksgiving to December 23. U-Choose & Cut your own: White Pine, Douglas-fir, Concolor Fir. 92 Indian Trail Road, Burleigh, NJ 08252. Phone: 609-884 2370. 4425 Fidler Road, Dennisville, NJ. Phone: 609-861-5537. Open: 12 to 6:30 (Monday to Friday), 9-6:30 (Saturday and Sunday), from the day after Thanksgiving to December 23.Directions: Rte. 47 to traffic light at Dennisville Lake. Turn on Rte. 610, go 1/4 mi., make left on Fidler Road Go 1 and 1/2 miles Farm on left. Payment: cash, check. 1957 Tuckahoe Road Route 631, Petersburg, NJ 08270. Phone: 609-628-3346. Alternate Phone: 609-335-2270. Fax: 609-628-3346. Email: ttuckahoe1@comcast.net. Open: from the day after Thanksgiving on every weekend until Christmas Eve; Friday 12 pm to 4:30 pm; Saturday, and Sunday, from 9 am to 4:30 pm​. Click here for current open hours, days and dates. Updates: Click here for updates. Directions: Visit our web site for directions. Click here for a map and directions. Blueberries:Every day, from 7 am to 1 pm, June 25 pm to July 31; Christmas Trees:Friday, Saturday, and Sunday, from 9 am to 4:30 pm, from Thanksgiving to December 24. Payment: Cash, Check. Click here for our Facebook page. We have added a shop filled with unique gifts and decorations created by local artisans. Fresh wreaths and grave blankets can be purchased or ordered to pick up with your tree. Cash, check or credit cards accepted. When you are ready, our workers will cut your tree, bale it and securely tie it to your car for a safe journey home. Visit the barn to select or order a freshly made wreath or grave blanket...and don't forget your slate ornament! You Choose and We cut varieties: Blue Spruce, Canaan Fir, Colorado Blue Spruce, White Fir (Concolor Fir), Douglas Fir, Nordmann Fir, White Fir (Concolor Fir). PreCut varieties: Fraser Fir, Grand Fir. 839 Barrett Run Road, Bridgeton, NJ 08302. Phone: 856-453-0125. Alternate Phone: 609-364-3066. Email: toon121499@aol.com. Open: Monday to Friday from 1 pm to 4:30pm; Saturday and Sunday from 10 am to 4:30pm, from December 1 to December 23. Directions: Follow Route 77 S through Bridgeton until it ends at Rte. 49. Make right on Rte. 49. Continue through Bridgeton into Hopewell Twp. until yellow caution light at Barretts Run Road. Make right. Continue 1.5 mi. Farm on right at bend, just past Shoemaker Road. Click here for a map and directions. Payment: Cash, only. You-Choose and You-Cut varieties: Canaan Fir, Colorado Blue Spruce, Douglas Fir, Eastern White Pine, White Fir (Concolor Fir), and other varieties (call!). You Choose and We cut varieties: Blue Spruce, Canaan Fir, Colorado Blue Spruce, White Fir (Concolor Fir), Douglas Fir, Eastern White Pine, White Fir (Concolor Fir), White Pine. Living, rooted tree varieties: Blue Spruce, Colorado Blue Spruce, Douglas Fir, White Pine. 461 Fairton-Millville Road, Bridgeton, NJ. Phone: 856-451-2626. Directions: From Bridgeton: take Bridgeton-Fairton Road to Coastal Mart in Fairton and turn left. Go about 4 miles and look for our green signs. From Millville: turn on Beech Street from Rte. 49. Follow it to Fairton-Millville Road. We are 2 miles past the 2nd blinker. Look for our green signs. Open: 10 am to 5, daily, from December 1 - 24. 8834 Lebanon Road, Rosenhayn, NJ 08352. Phone: 609-451 9473. Open: 9 am to 5 pm on Friday, Saturday and Sunday from the day after Thanksgiving to December 23. Directions: Turn left at first traffic light onto Gershel Avenue. Go 1.7 mi. to Lebanon Road. Turn right onto Lebanon Road 3rd house on right. We're a "you choose, we cut" primarily farm. We do have handsaws for customers who like to do the job themselves. We even allow digging for the bulb of the tree, if you want to. (We don't recommend although because the process can take several hours and it's the winter at that. Also many don't replant properly). Besides that we have wreaths and garland that can be custom ordered. We have thousands of trees. 52 Newport Road, Newport, NJ. Phone: 856-447-3814. Directions: From Millville, follow signs toward airport. Go past airport (Cedarville-Millville Road). Follow through 4-way stop - approximately 3 miles to County Rte. 629. Turn left toward Newport/Fortesque. Farm is on left side, approximately 2 miles Just past railroad tracks. Open: 9 am to dark, daily, from the day after Thanksgiving to December 24. U-Choose & Cut your own: Blue Spruce, Douglas-fir Concolor Fir. 165 Woodruff Road Upper Deerfield Township, Bridgeton, NJ 08318. Phone: 856-207-3254. Alternate Phone: 856-455-3700. Fax: 856-455-1332. Email: ron@rmlupton.com. Open: Friday 3 pm to 5 Sat and Sunday 9 am to 5. Directions: Landis Avenue Upper Deerfield Township, Cumberland County- north on Woodruff Road between Landis and Richards. Rt 77 to east on Richards road to south on Woodruff. Rt 553 between Richards Road and Landis Avenue. Click here for a map and directions. Payment: Cash, Check. You Choose and We cut varieties: Colorado Blue Spruce, Douglas Fir, Eastern White Pine, Norway Spruce. 130 Roadstown Shiloh Road, Shiloh, NJ 08353. Phone: (609) 364-4137. Email: sharontree2@aol.com. Open: from the day after Thanksgiving, daily, from 9 am to 5 pm pm until Christmas Eve. Directions: Route 49 to Shiloh follow signs. Click here for a map and directions. Payment: Cash, Check, Debit cards, Visa/MasterCard, Discover, AmEx. Santa on weekends, stand straight stands. U-Choose and Cut varieties: Blue Spruce, Douglas Fir, Eastern White Pine. You Choose and We cut varieties: Blue Spruce, Douglas Fir, White Pine. Living, rooted tree varieties: Douglas Fir. 391 Old Cohansey Road, Bridgeton, NJ 08302. Phone: 609-381-5253. Alternate Phone: 609-381-5255. Email: vanmeterfamilyfarm@gmail.com. Open: Monday to Friday Appointment ONLY, please call; Saturdays and Sundays 8 am till dusk. Directions: Click here for a map and directions. Payment: Cash, Check. You Choose and We cut varieties: Blue Spruce, Douglas Fir, Norway Spruce. Living, rooted tree varieties: Blue Spruce, Douglas Fir, Norway Spruce. 1250 Lacey Road, Forked River, NJ 08731. Phone: 609-693-3513. Fax: 609-312-7693. Email: angela@argosfarm.com. Open: Day after Thanksgiving to Christmas Eve Wednesday to Friday from 1 pm to 6 pm; Saturday from 10 am to 6 pm; Sunday 10 am to 4 pm. Click here for current open hours, days and dates. Directions: Take Garden State Parkway South to Exit 74. Make a left onto Lacey Road West. Within one mile Argos Farm is located on the left. Click here for a map and directions. Payment: Cash, Debit cards, Visa/MasterCard, Discover, AmEx. Click here for our Facebook page. 32 Holmes Road, New Egypt, NJ 08533. Phone: 609-901-0660. Open: UPDATE for 2018, Their website is down, by a visitor tells me they are still open; Saturday, Sunday 8:30 am to 5 pm through the weekend before Christmas. Directions: Click here for a map and directions. Payment: Cash, only. Our farm was established in 1993, and is family owned and run. We have 15 acres and over 3000 trees. It is home to a variety of animals. cats, dogs, & horses. Clyde our horse is retired but he is a world champion and a 3 x reserve world champion. He loves children and loves seeing all the folks at Christmas. You-Choose and You-Cut varieties: Blue Spruce, Canaan Fir, Colorado Blue Spruce, Douglas Fir, Fraser Fir, Norway Spruce. You Choose and We cut varieties: Blue Spruce, Canaan Fir, Colorado Blue Spruce, White Fir (Concolor Fir), Douglas Fir, Fraser Fir, Norway Spruce. Railroad, Waretown, , NJ 08758. Phone: UNKNOWN. Open: for hours and availability. Directions: directions. Payment: Cash, Check . This is a family run business. Trees are grown and planted within the family. They cut wreaths to buy as well. (ADDED: November 18, 2016, Suggested by a visitor) Does anyone know their phone number, email address or complete address? The visitor gave us some information... but we are missing the most important... a means to contact them! A visitor writes on November 18, 2016: "5 stars. I have grown up getting my trees there. Cutting them myself and dragging it out with my brother. " 173 Pasedena Road, Manchester, NJ 08759. Phone: 732-350-4020. Open: A visitor writes on November 06, 2016: K & W Nursery will not be open for the 2016 Christmas Season; Please check back next year (2017) , when our hours should be Friday, Saturday and Sunday, 8 am to Dark. Opening Thanksgiving Weekend; Pretagging available.Directions: From the North: Parkway South to Route 70 West. Left onto 539 South. Right onto Pasedena Road. 2 Miles on left hand side. >From the South: Route 72 to 539 North. Make Right onto Pasedena Road. 2 Miles on left hand side. And for a map to our farm, click here. Our products are usually available in November, December. Payment: Cash, only. 139 Brynmore Road, New Egypt, NJ. Phone: 609-758-9449. Open: 9 am to 4 (Saturday and Sunday), Saturday after Thanksgiving to December 22. Directions: From Main Street, New Egypt, across from Town Hall Bldg. (white with pillars), turn onto Brindletown Road Second left turn onto Brynmore Road. Proceed approximately 1 1/4 mi, farm on right.Click here for a link to our Facebook page. U-Choose & Cut your own: Blue Spruce, Norway Spruce, Douglas-fir, Canaan Fir, Serbian Spruce. 50 South New Prospect Road, Jackson, NJ. Phone: 732-370-8733. Open: the day after Thanksgiving and Closes December 19th; Weekday Hours are 11 am to Dark; Weekend Hours are 9 am to 5 pm; opens at 9 am on the day after Thanksgiving, from the day after Thanksgiving. Directions: Lakewood Area: Rte. 9 to W. County Line Road to New Prospect Road Howell Area: Aldrich Road W to New Prospect Road, Make left at New Prospect Road. Click here for a link to our Facebook page/a>. U-Choose & Cut your own: Norway Spruce, White Spruce, White Pine, Douglas-fir. 24 Buckalew Lane, New Egypt, NJ 08533. Phone: (609) 758-5855. Email: ltnatoth@comcast.net.. Open: starting on the Friday after Thanksgiving; then Saturdays and Sundays only until December 22nd (the Sunday beforer Christmas) from 9 am to 5 pm. Directions: 1 mile south of New Egypt Speedway on Route 539. Third left onto Buckalew Lane. Click here for a map and directions/a>. Payment: Cash, Check. U-Choose and Cut varieties: Douglas Fir, Norway Spruce. 138 Evergreen Road, New Egypt, NJ. Phone: 732-349-2705. Open: 9 am to 4, daily, from Saturday after Thanksgiving to December 23. Directions: 7 miles W. of entrance to Great Adventure on Rte. 537. Evergreen Road starts on S. side of blinking light on Rte. 537 (Evergreen Road ends on Main St. in New Egypt). UUUUU-Choose & Cut your own: Blue Spruce, Norway Spruce, White Pine, Douglas-fir.